I decided to do a remix with these shorts of mine using different capes to create different looks. I'm thinking about three or four; including the white one I posted earlier this week. These shorts are probably the item I've featured most often on my blog, as I just think they go with everything - which also is why I wanted to use them in this remix. It's a very whimsical look, I think; and though I'm not the most colorful person out there - I'm always up for a challenge when it comes to clothes! I do love experimenting, and this cape is perfect for that! It's a very unique and strong piece which just fits perfectly over my shoulders. I think it deserves all the attention it can get, so I combined it with black and gray. I absolutely love this look, and that cape! It's nice to see you in colour every so often, especially with the perfect white landscape! 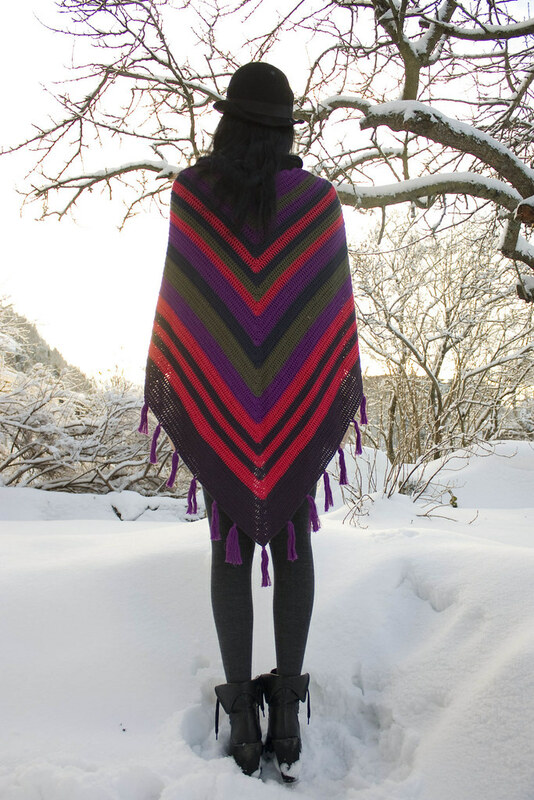 Especially loving the bright pink stripes on the cape! And I adore your shoes <3 May I ask where you got them? im gonna go check out nelly.com now for those bootie wedges! fingers crossed. Love the colors in that cape! The capes are so fun. I don't know how you wear shorts in this weather, that's awesome. What a great look! The colours are perfect together. Haha, I don't know what I would do if I didn't wear shorts in winter - I'm just not a pants girl :p Thanks, sweets! OHH my goodness, love this outfit so much! Love the cape, it's totally breathtaking. The colors are just amazing! Love love love this look. You're stunning. Love the otk socks too! This is going to my inspiration folder. I'm so going to try this on winter. LOve the colors. You know, that kind of capes, in those colors are so popular here in chile, handmade and all that. I'll look for a good one.